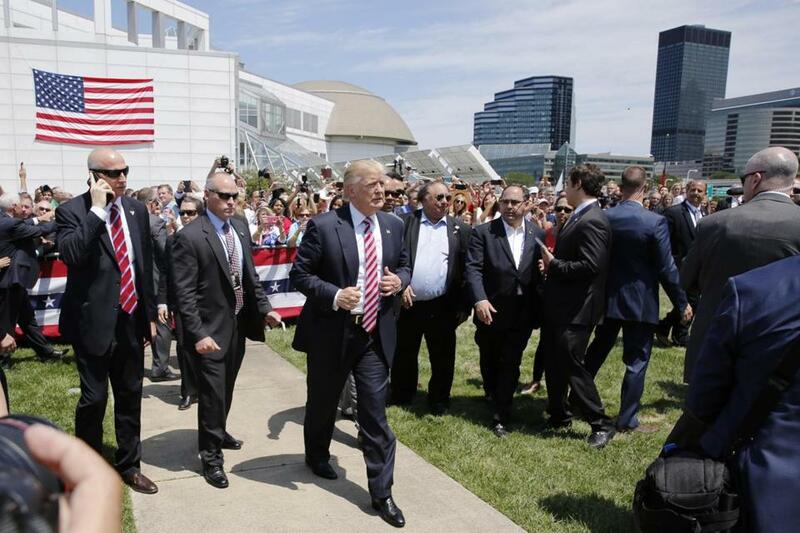 Donald Trump arrived in Cleveland on the third day of the Republican National Convention. CLEVELAND — The keys to the Republican Party now belong to a onetime Democrat, a man who has lambasted top Republican Party leaders, a man who diverges from the party’s longstanding orthodoxy on an array of central issues. It’s Donald Trump’s party now. And his party is one of anger and division, one that is sick and tired of the status quo and skeptical of all elected officials. It is one that is proudly vulgar, one that peddles in innuendo and conspiracy, and one whose members will speak of shooting the presumptive Democratic nominee for treason or chant in unison, “Lock her up!” It is one that is short on specifics but adamant about bumper sticker promises about building a wall to keep out illegal immigrants and about making America great. Some Republicans fear that they could lose voters for decades, and that the grip Democrats have on the growing segment of minority voters will only get firmer. They worry that the Republicans’ majority in the Senate is at risk, and possibly the House majority, too. Others no longer recognize what their party is becoming. “I’ve made the decision not to watch except for highlights on the morning news,” said Seth Klarman, a Boston billionaire who was the biggest donor to Republicans from New England in the 2014 election cycle. Klarman, who is an independent, just cut a $5,400 check to Hillary Clinton’s campaign. One day after Trump officially secured the nomination, Republican delegates in Cleveland Wednesday spoke openly with pride — as well as apprehension — about their party’s new standard-bearer, illustrating the divide that’s plagued the primaries ever since Trump glided down an escalator in Trump Tower last year and announced he was running for president. Some continued to criticize Trump’s negative tenor and divisive rhetoric and expressed concerns about the party’s ability to attract younger voters, especially minorities and women. Richmond, vice president of Running Start, a nonpartisan organization focused on encouraging young women to run for office, said about half the people she trains are women of color. She worries that a Republican Party led by Trump will not only discourage minority women from joining the GOP, but also turn them off to politics, period. “I wish I could be more excited being here at the convention,” said Richmond, who plans on writing in a candidate in November, probably Romney. More than halfway through the convention, the party seems to be what Trump might have called “low energy,” the phrase he once used to describe Jeb Bush. Some attendees have already left, and the seats have never been completely full in the arena where the NBA champion Cleveland Cavaliers play. During the first two nights, most delegates had filed out by the time the final speakers took the stage. After months of opposing Trump, House Speaker Paul Ryan and Senate majority leader Mitch McConnell both took the stage Tuesday night, declaring their support for the nominee. McConnell was booed, and Ryan — a onetime wunderkind of the Republican Party — was received tepidly as he gave a speech rich on policy. And on Wednesday, former rival Ted Cruz spoke, but declined to endorse Trump. While each day has had a theme, there is little cohesion among the speakers, and the name Clinton is uttered far more often than the name Trump. Yet, in an interview this week, Anne Copp, a New Hampshire delegate from Danbury, pushed back on the notion that Trump is sexist and racist. In fact, she said, Trump is making the GOP more inclusive. Other delegates credit Trump for expanding the party base to appeal to blue-collar union workers who have traditionally voted Democrat by focusing on international trade and prosperity, as well as voters disenchanted with the Republican establishment. “I didn’t get the appeal at first,” said Chris Ager, a New Hampshire delegate from Amherst who had supported Scott Walker and Marco Rubio. Some social conservatives say they are even willing to overlook Trump’s more moderate positions on traditional Republican stances on gays and abortion because they would rather see the next Supreme Court justice appointed by Trump than his Democratic rival. In other words, they agree with him on enough to make him acceptable, especially when compared with Hillary Clinton. “I am very hopeful in the direction that Trump can take the party,” said Curtis Hill, the Republican nominee for Indiana attorney general. “He has captured a movement and brought energy to the campaign and he wants to make America great again. What is wrong with that? Georgia activist Debbie Whelchel is concerned about what direction Trump will take the party. Annie Linskey and James Pindell of the Globe staff contributed to this report. Matt Viser can be reached at matt.viser@globe.com.